Andreas Lanz is a personal trainer and the owner of TATKRAFT Creative Training in Bern. He has been supporting people on their way to a healthy and balanced way of life for years. In this interview, he talks with us about performance society, motivation problems and nutrition. For many people, exercise is about their appearance. One wants to be slim or have well-defined muscles. You believe in a different approach, namely the one of a “functional body”. What is this about? Today, fitness is often associated with a visible result. However, fitness is mainly concerned with health. No matter if 2-5kg heavier or lighter, it is much more important to have a functional body, than a perfect appearance. If you exercise regularly, a good body feeling will follow automatically. Exercising in order to comply with a certain body ideal often leads to one-sided training, which can make your body even more “unfunctional” than before. Of course, we also have clients with the goal to change their appearance, but, funnily, after 1-2 months, this goal often fades into the background. People realise that a good body feeling is a lot more important. Once they get a better feel for their body, this automatically pushes their self-confidence. You have been doing this for 15 years. What kind of clients do you have? Personal training is especially popular among people in middle to high managment positions – or generally among people who are very busy. The market for personal training is growing steadily, which might be due to the fact that people like to hand the responsibility for training over to someone else. Instead of a subscription at the fitness centre, which they never use anyways, they rather want a fixed time and someone who decides for them what to train. That way, they doubt less and they need less self-propulsion. You write in your books that strength training with one’s own body weight is more efficient, or at least as effiecient as the one with machines. Would you say that all the developments in the fitness world have been unnecessary? Yes, for a large part of the population I would claim that they have. The body is a personal fitness studio, which provides you with everything. There are a lot of exercises with your own body weight, which are extremely challenging and with which you can trim yourself very fit, given that you have a bit of discipline. I am not completely against additional weights, professional athletes may even need those. Even machines have their justification, for example, for building up muscles in an isolated way after operations. However, machines are very “unfunctional”. One sits at the machine and pushes or pulls a weight in one or the other direction. But we sit enough in our every day lives already. Therefore, we should rather learn to move and to stabilise our bodies in any possible position. This is much more helpful in everyday life. Also in terms of nutrition, the main message in your books is ” go back to basics”. What do you mean by that? What is the problem with today’s nutrition? When I hear diet, I generally tend to walk backwards. We should not lead our bodies into starvation, which may result in a momentary weight loss, but for which we need to reward ourselves again shortly after. This is exactly what causes the famous yoyo-effect. Less calories make any peoples’ weight drop, this is no piece of art. The piece of art is to find a calorie balance for your own body, at which you neither lose nor gain weight, at which you feel good and you don’t feel tired, thirsty or hungry the whole time. However, this balance is very individual. So, the solution is to orient to what people ate in earlier days? I always say: you can eat anything. The dose makes the poison! You may treat yourself with some chocolate or a slice of cream cake once in a while. But you have to be aware of the fact that this is enjoyment and that it has nothing to do with nutrition. As a rule, I think about what we ate in this region about 150 years ago. For example, vegetables or meat from the region – however, not too much meat. People occasionally ate meat on a Sunday maybe. Also, there was no overflow of sugar. It is important to always consume food with a certain mindfulness, to watch yourself and to observe what actually happens to you while eating. This is better than listening to what “people” say. Because “people” are not you! A lot of people start exercising, but they often quit soon afters. Do we have a lack in energy in today’s performance society? Yes, this is certainly true! Life in the 21th Century has become tough and society makes high demands on us. The question is: What is more important to me, the demands of society or my own life? I keep noticing that people hide behind excuses. “Before you exercise, you first need to recover from the tough everyday life”, people say, for example. Or people blame their bosses, since they allegedly overcharge them. In theory, we all want the same, and we also have as much scientific knowledge as ever before. However, many people fail to realise these goals in practice. You need to have a certain degree of self descipline and you need to take responsibility for yourself if you want to take care of your health. But many people prefer to look for someone who solves their problems for them. We in running.COACH try to be a support for runners with our individual training schedules. But still, we often get asked by people how they should motivate themselves. It can help to make the gear ready already the evening before. That way, you start before you can even realise that you are not motivated. Secondly, for runners, having a running partner may be very useful. Once one person is more motivated, once the other. And if someone is waiting for you, you don’t normally stand that person up. What I keep doing for myself, and what I know many professional athletes do, is to keep the focus on my goal. This does not have to be keeping up with Daniela Ryf in a marathon. It can simply be to feel good during the day or to become more resistant to illnesses or stress. If you don’t have a WHY, it is difficult to follow through with something over a longer period of time. This all sounds rather rational and target-oriented, although we just talked about mindfulness and being sensitive to what your own body tells you. When would you say it is ok not to train? Motivation is always target-oriented. But if we are mindful, we can feel when training is good for our body and when it is not. This has nothing to do with making excuses, but with honest self-perception. Especially with runners, I have often observed that they keep training regardless of pain or tiredness – out of fear of losing their shape. This often results in visits at the physiotherapist’s. Discipline is also listening to how you feel and what your body needs. I therefore consider minduflness to be a crucial part of physical fitness. How did you arrive at all of these insights? Have you always seen things this way or did you fight with similar problems to the ones of your clients? I practised Swiss wrestling on a high level for 15 years, and I have also done judo and bobsleighing as a pusher. At that time, people didn’t know as much about training as today. I have often trained the wrong way, I have exceeded my limits and I have been slowed down by injuries. I thought, it is unnecessary for others to make the same mistakes. On the other hand, I have always liked experimenting. I once I had myself run into an overtraining on purpose, in order to see what that feels like. I do not recommend this to anyone! During my 15 years as a personal trainer I have noticed over and over again: People are constantly at their limits, until they do not feel themselves anymore. I have read lots of books and I have educated myself about these topics. In my books, I present my own view on these issues and I try to give people the easiest tools possible to facilitate their everyday life. As soon as one takes responsibility for oneself and has some discipline, one can get quite far with a little effort. Thank you, Andreas, for this interesting interview and we wish you all the best for the future! 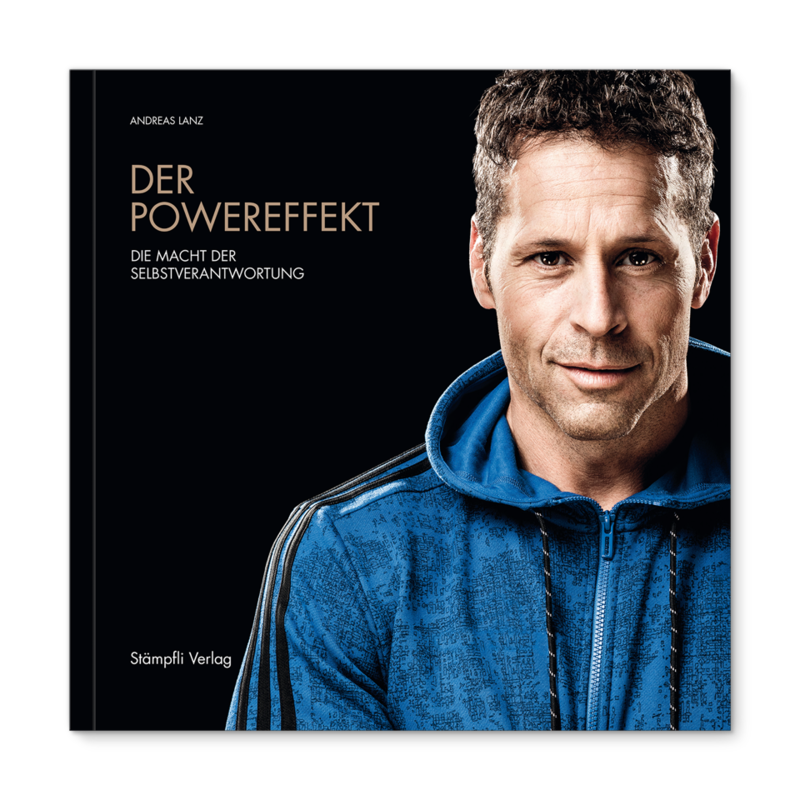 Andreas Lanz is the owner and manager of the enterprise TATKRAFT Creative Training, which, in addition to personal training on all levels, also focuses on consultations in the fields of nutrition, health and well-being. Furthermore, he has published the books “Das AWL-Prinzip” (2013) and “Der Powereffekt” (2018). Andreas regularly gives talks in the fields of corporate fitness as a health counsellor and a motivator. On the website you can find more information about Andreas, about his team and about the philosophy of the company.